An unmanned Dragon space capsule is seen captured by a robotic arm at the International Space Station as it delivered fresh supplies to the outpost's crew on July 20, 2016. Astronauts aboard the International Space Station have snagged a SpaceX Dragon supply spacecraft, which reached the station today (July 20) after two days spent catching up to the station. At 6:56 a.m. EDT (1056 GMT), NASA astronaut Jeff Williams, the space station's current commander, used the 57.7-foot (17.6 meters) Canadarm2 robotic arm to grab the incoming craft as it rendezvoused with the space station. Williams was assisted by NASA astronaut Kate Rubins and Japanese Aerospace Exploration Agency astronaut Takuya Onishi. Over the next hours, ground controllers will direct the arm from Johnson Space Center in Houston, to install the craft on the Earth-facing side of the space station. Then, the crew will pressurize the area between the craft and the station and open the hatch, and they'll unload the craft over the course of the next five weeks. An additional massive piece of equipment, adding more than 1,000 lbs. (450 kg), is riding along in a separate compartment on Dragon (its "trunk") — the first of two International Docking Adapters that will let crewed spacecraft dock with the station's U.S. segment for the first time since space shuttles visited. (At first, that will include Boeing's CST-100 Starliner and a crewed version of SpaceX's Dragon, but the dock is standardized so that many future vehicles can visit.) NASA will use the robotic arm to pull out the adapter and position it near the port it will go on, and it will be up to spacewalking astronauts to affix it to its new location. Dragon will detach from the space station on Aug. 29, bringing more than 3,300 lbs. (1,500 kg) of science to analyze and other supplies back to splash down in the Pacific Ocean. 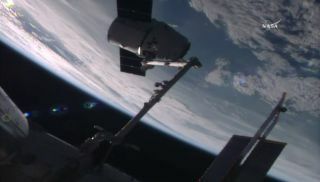 Russia's Progress 64 spacecraft — which arrived at the space station Monday night (July 18), several hours after Dragon launched from Cape Canaveral, Florida — will stick around for more than six months, NASA officials have said.